You might wonder if that caterpillar inching his way across your favorite plant is going to turn into a moth or a butterfly. Washington state is home to hundreds of varieties of moths and butterflies, so it can be difficult to identify exactly what you're looking at. Look closely and take notes. After developing in his egg, the caterpillar will emerge as a first instar. When he molts, he'll begin his second instar at a larger size. Each time he molts, he enters into a new instar and increases in size. Most caterpillars experience five instars and change dramatically in appearance between molts. The first instar is usually a simple, unmarked body; as the caterpillar matures and motls, his body forms and color likely will change. 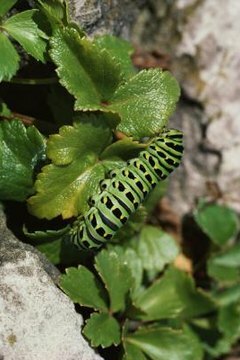 Caterpillars can be confused with other creepy crawlies, such as the larvae of the sawfly, so make sure the creature you're trying to identify is really a caterpillar. A caterpillar's head is helpful in confirming he's a caterpillar, as well as what species of caterpillar. The amateur may not be able to determine if the larva has an adfrontal suture on his head, but you may see six eyespots on his head. He'll also have a silk gland you may be able to discern lower on his head, near his mouth area. A caterpillar has three thoracic sections and 10 abdominal segments. His thoracic area is where his real legs are; his abdominal area has his "prolegs," which have "crochets," or hooks, on them. Once you've determined you're really looking at a caterpillar, spend some time getting to know the guy. First look at his color; is he a bright green or a dull brown? Note any patterns he has; some caterpillars sport vertical stripes running down their sides, while others have spots or bands. He may have no pattern or he may be a bit camouflaged to blend with leaves. If he's a fuzzy guy, take note of how much hair he has and where it is. Look for special features, such as a split tail, knobs or head horns. Finally, pay attention to where you see him; does your guy favor a certain tree or plant? Certain caterpillars will feed on specific plants and understanding what he's feeding on can help to identify him. Now that you've gathered all your information, you can put it to use. One option is to go on line to a site such as DiscoverLife.org where you can input your data and find a potential match. Washington State University also can identify your caterpillar for a fee. Its website, which has mailing information, directs you to kill your insect by freezing it and allowing it to stay in the freezer overnight. Your sample should be gently packed in tissue, cotton or a vial for the mail. Your local extension service, garden center or librarian also may be able to help you with the identification process.